If you've ever felt beckoned by the sea, we know where you're coming from. The pull of the ocean, like the moon that governs its tides, is elemental. It seems to come from somewhere deep inside. Which is not unlike our connection to the soil that sustains our food. That's the magic of Martha's Vineyard, a stupefyingly picturesque island that harbors a diverse and grassroots collection of agricultural pursuits, sure to satisfy any craving. I grew up with my mom's spectacular gardens and orchards. She was actively involved in grain and milk co-ops (run from our garage), delivering local and unique foodstuffs throughout our area. We picked strawberries before school and gathered fallen apples for handmade cider. As an adult, though, I followed my entrepreneurial spirit into the business world, spending much of my time in New York and London. When I moved to Martha's Vineyard, where I live with my husband and son, my focus back to food was revitalized. Martha's Vineyard has a unique food culture and the islanders' commitment to locavore living is something I hadn't experienced before. I invented it! Farm. Field. Sea. was sparked by a "very Vineyard" potluck-style dinner I attended where a random mix of friends gathered for a alfresco 'locally grown only' meal. The conversation was so engaged around food - from basic garden tips to the challenges of todays' soil & sea farming - I decided there and then that I wanted to create an opportunity for other people to learn about the unique food culture of the Vineyard from source to production. What makes Farm, Field. Sea stand apart is foodie and adventure travelers experience the island in a 'sleeves-up and hands-dirty' way. We dive behind the scenes. 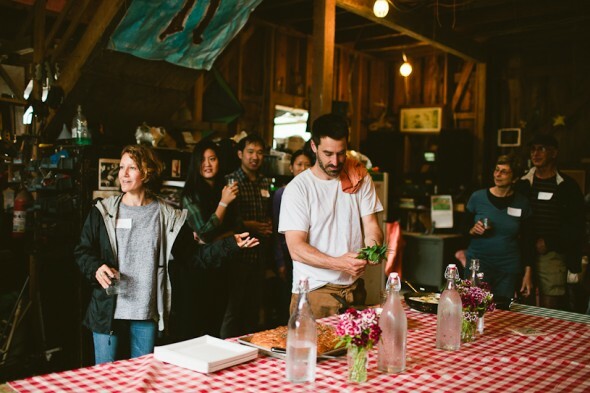 It's not just a farm tour or a cooking class, its connecting them to their food at its source AND learning how to bring it to their dining table. I am happy to report, that's how it has turned out. Our guests journey to some of the premier family-owned farms and learn about the history and craft of sowing, harvesting, and tending animals. In the field, they learn and experience butchering chicken, beef, lamb, and pork (not all at once!) in a mindful, sustainable way, and why loving care for animals translates into good meat. They also meet the Island's fishmongers and shellfish farmers to learn about fish, lobster, and other shellfish native to Martha's Vineyard. In an educational tour, our guests are exposed to the skill required to farm oysters and mussels in the Island's great ponds. And they have fun learning how to debone and cook fish, and shuck and eat oysters just like a native Islander. Finally, at one of the Vineyard's magical locations, we meet at the dinner table with old and new friends to have fun and enjoy an unforgettable meal. This is lovingly prepared from a menu that our guests have helped craft, with Vineyard grown products that they have gathered. I have always been a 'sleeves up and hands dirty' kind of person. I have owned my own company for a decade, with a focus on building marketing, grassroots, community organization, and events campaigns for independent films and social-cause projects. Each venture demands different strategies for audience communication and engagement. Luckily, this experience is applicable to almost any industry. My goal is to continue to grow Farm. Field. Sea by using my work experience to help connect the island's sea and soil farmers and local chefs - who are excited about sharing their knowledge and skills - with hungry guests who want to expand their food engagement beyond their local farmers' markets. Ideas take time to germinate, and many times it's hard to make a living while nurturing projects as they grow. I know my "Good Food Job" Farm.Field.Sea, An Island Culinary Adventure is a great idea as I have seen first-hand how transformative an intimate experience with growing, harvesting, and cooking your own food can be. So, I am working hard to make it a thoroughly enjoyable and rewarding experience for all those involved (from guests to farmers!). We also work with local photographers to capture each Farm. Field. Sea event. A story told through pictures is so powerful and I think really illuminates what you can do/see at this unique food experience. I think 'farm to school' is one of the most exciting food-centric movements right now. If we can teach kids about healthy eating and what good food can do for their body, mind, and the world, I believe that this new generation can spearhead seismic, positive change, and help fix our broken food system.